Adults, and even children, alike, can do things that aren’t queue-t. Summer is the season of waiting in line. At theme parks, on highways, and most notably at airports, people are spending hours standing among strangers. In fact, it has been estimated that the average American spends 2 years of his or her life waiting in line. 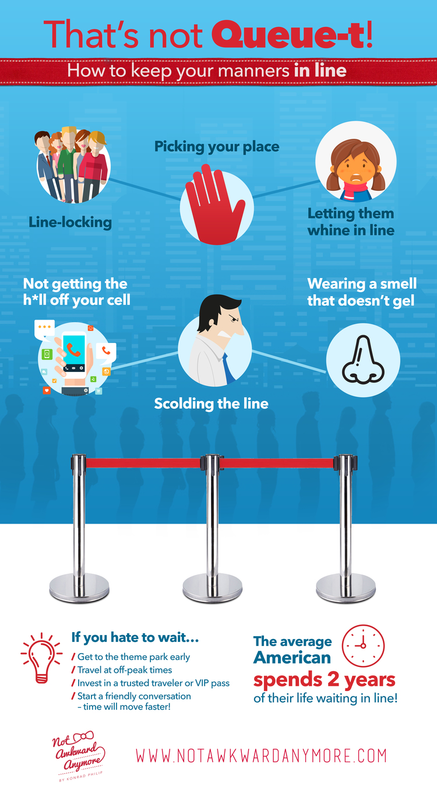 While conveniences like online check-in and priority passes can make your summer more enjoyable, so too can avoiding the following behaviors. “Linelocking” means creating gridlock in line. Try to keep the length of the line as short as possible (without breathing over someone else’s shoulder!). Keep your bags close in front of you. This takes up less room than keeping them at your side where they could trip or impede people passing by, or behind you where they’re not as safe. When traveling you should expect to wait in line. Knowing that, be as bearable as possible to strangers. Avoid strong perfumes, including the “BO Collection”. Same goes for food; recent surveys have found smelly food to be a top annoyance for airline travelers. If you have kids prepare them for the wait ahead of time by bringing something to keep them entertained or make other arrangements, such as signing up for a priority pass. Nobody likes to hear whining, and though I’m not THAT young, I imagine that small children don’t enjoy whining either. Not getting the h*ll off your cell! You can speak quietly to others, but refrain from talking on your cell phone – it is much harder for our brain to shut out one-way conversations and nobody wants to hear yours! If you have earphones in your ears, be mindful of your surroundings. Keep the volume moderate enough so that you can hear what is going on around you, and others can’t hear your music. There has never been just one angry person in a line. Agitation quickly spreads. Avoid raising your voice or demanding to be served first. It won’t mean much when everyone around you starts doing the same. If you have an urgent matter or a complaint, get the attention of an airline employee and speak to them respectfully. They are much more likely to help someone who is likable. Don’t scold, just hold it! If you’re unsure, always ask if you’re at the back of the line. At an airport, should you be worried about missing a flight, notify an airline employee. If you’re not, consider switching places with someone immediately behind you who’s in a hurry; it’s a small gesture that could be rewarded nicely. Remember that part of “saving” a spot in line for someone is leaving once they take it! Understand that waiting in line is not common practice in all countries. Tourists from other parts of the world may have never been taught to line up and may instinctively push and shove their way to the front.